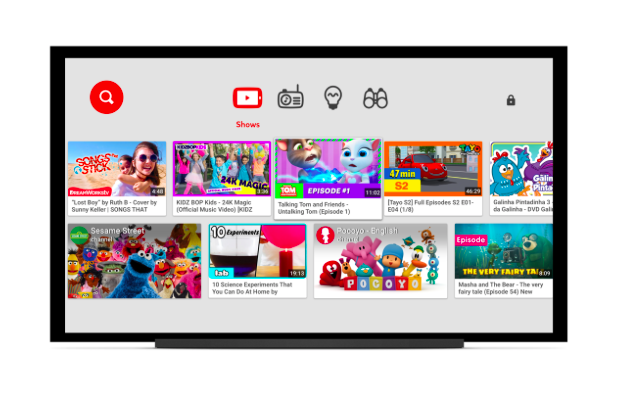 Interface of YouTube Kids on TV is similar to its version for smartphones and tablets. On Smart TV, the app would be a treat for kids as they will be able to watch their favorite shows and videos on a bigger screen with easy to navigate options. On TV, the YouTube Kids has a red search icon with kids-friendly categories like shows and learning, placed next to it. The video search results are displayed in a card-like format containing the title, duration, and thumbnail of the video. It has the same parental controls as available on smartphones and tablets. Now with the advent of YouTube Kids on Smart TVs, it would be easier for parents to give the program selection control to their kids. The app is the first Google product that is made especially for kids and has proper video categories and filters to let children explore videos on their favorite topics. The app is growing in popularity and presently boasts 8 million weekly active viewers and 30 billion total views. These are the compatible Smart TVs for the YouTube Kids app. If you have any of these, then install the latest firmware update available on your television or head to the app store within it. 2015 – 2017 LG webOS TVs via the LG content store. 2013 – 2017 Samsung Smart TVs and Blu-Ray Players that have access to the Samsung App Store. 2016-2017 Sony TVs (with the exception of Android TV, which will be available soon). Currently, YouTube Kids is available for users in Argentina, Australia, Brazil, Canada, Chile, Colombia, France, Ghana, India, Ireland, Kenya, Malaysia, Mexico, New Zealand, Nigeria, Peru, the Philippines, Russia, Singapore, South Africa, Spain, Tanzania, Uganda, the United Kingdom, the United States, and Zimbabwe. YouTube is working to expand to other countries. For the countries mentioned above, YouTube Kids availability on compatible Smart TVs is also dependent on the individual television manufacturer.